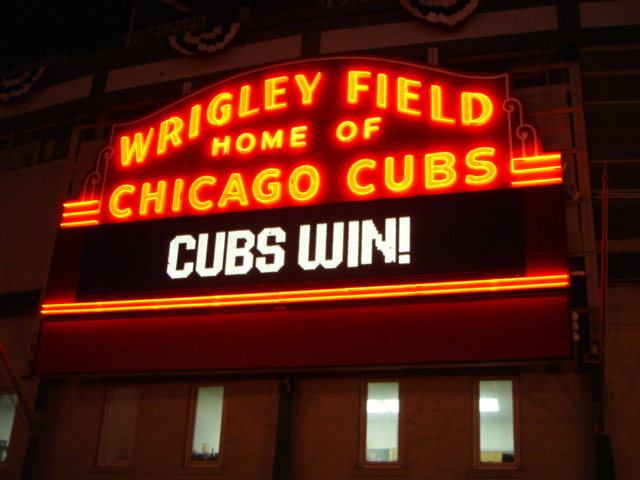 A rare “Cubs Win” sign. As a fan of the Chicago White Sox, I’m not surprised that the Chicago Cubs would get their most publicity from a fan catching a foul ball. The baby didn’t miss a drop of his bottle! That guy could be playing baseball! Talk about staying calm in a difficult situation! OK…I don’t know the guy and, generally speaking, he may be super dad. But it isn’t how this dad would have played the ball. If I were holding a baby and a foul ball were headed my way, I would turn my back to the ball and shield the child with my body. I wouldn’t risk misjudging the ball and it hitting the baby. I would make sure that if the ball hit someone, it would be me. My priority would be protecting the child, not getting a foul ball. I’m just glad the baseball didn’t smash the kid in the head.